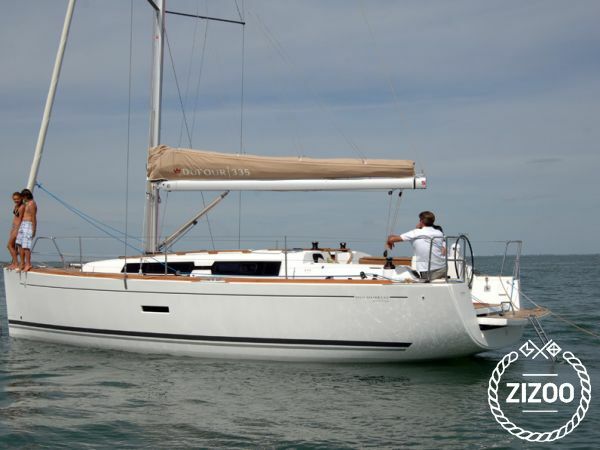 Lara is a lovely brand new Dufour 335 GL based in Sibenik, waiting to be taken out to sea. She is a cute little thing perfect for a small family or a group of friends. For a boat her size, she is quite spacious both on and below deck, and the cockpit is large enough to even squeeze in more than 6, should you make new friends and invite them over for a G&T. Central Adriatic is one of the best sailing areas along the coast, as it has so many islands of all shapes and sizes for your to explore and have fun on. Kornati Archipelago is a national park for a reason, you will just love cruising around island upon island of unspoilt nature, sitting in perfect silence, disturbed only by the sound of your sails being pressed by the breeze. If you enjoy fishing, this is the best area to have a go at trying to catch your dinner, Lara's kitchen will provide everything you need for preparing a delicious meal for your crew! Last year I rented a boat on the spot in the marina Split and it was super expensive so this year I decided to plan ahead. I found Zizoo on the internet and managed to book a boat for half the price I paid the year before. The boat itself was even better and cleaner than the previous one. Nice job guys. A really perfect week. Excellent support from Zizoo during the preparation phase. The boat from 2014 was actually in good conditions and very well maintained. I suggest bringing euros in cash and exchange for kunas locally at a more favorable rate.